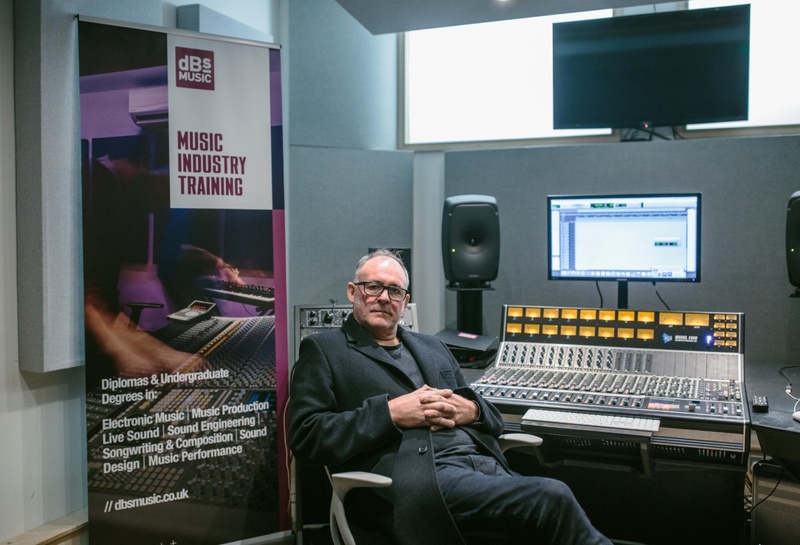 Portishead's Adrian Utley has made his career creating music that goes beyond the norm, and on Saturday 17th November, a group of dBs Music students helped continue that trend with the first-ever synth performance of Terry Riley's 'In C' at our Bristol HE centre. Organised by dBs Productions’ Jay Auborn, 16 brave students signed up for the special task of tackling Terry Riley’s famous piece. Originally performed and recorded in 1964, it would be almost five decades before Adrian began performing it once again, this time with a guitar orchestra. 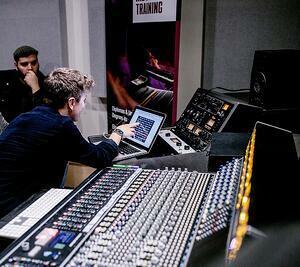 Now, Adrian and our students looked to take ‘In C’ to yet another new instrument. There’s a palpable buzz of excitement, peppered with no small dose of apprehension at such an undertaking. Downstairs in the Studio 3 live room the synth orchestra is being built; an Elka Synthex, DSI Prophet, Moog Sub 37 and a modular system are just a few notable members. Upstairs, Jay and Adrian take their seats in the filled out lecture theatre for a 2-hour foray into his career, processes and anecdotes. It’s hard not to be swept up in it all, particularly as Adrian is so humble. “I thought we’d [Portishead] been forgotten!” he utters during his chat with Jay, a comment that couldn’t be further from the truth. Tracing his path from jazz player in London, the breakout success of Portishead and the musical tributaries that make up the body of his recent work, there’s a collective desire to stay where we are and keep the conversation flowing. However, ‘In C’ beckons. 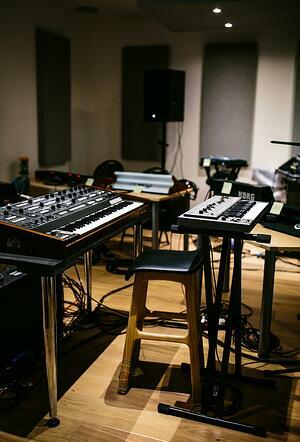 With the plethora of synths ready and waiting, the performers slowly fill the live room, taking a seat behind their respective machine that they’ve spent the last few weeks practicing on. Joining them are lecturers Tess Tyler [Music Composition for Film & TV] on Fender Rhodes and dBs Music Plymouth’s Matt Ward [Electronic Music Production] on modular synth, with Olly Wickes [Live Sound] manning the sound in the live room. In the control room it’s all a little ‘Superbooth showroom floor’ as a series of bleeps, bloops and other noises issue through the monitors as everybody’s levels are taken. Things soon take shape, and Adrian, guitar in hand, joins the synth orchestra for a final practice of some of the trickier cells in the piece, particularly cell 35! For those that don’t know, Terry Riley’s ‘In C’ is made up of 53 short phrases or cells that are meant to be played consecutively by a group of musicians. What makes it such an interesting and ever-changing piece is that the cells can be played in any octave and speed. The only rule is that each player must remain within 2 or 3 cells of each other, with the piece ending when all players reach the final cell. Gradually, the wall of sound begins to permeate through the building, and as Adrian and the orchestra move from cell to cell, ‘In C’ really starts to take on a life of its own. Those not performing crowd around the entrance before retreating to the control room for the actual recording, though none of us really know what will happen. 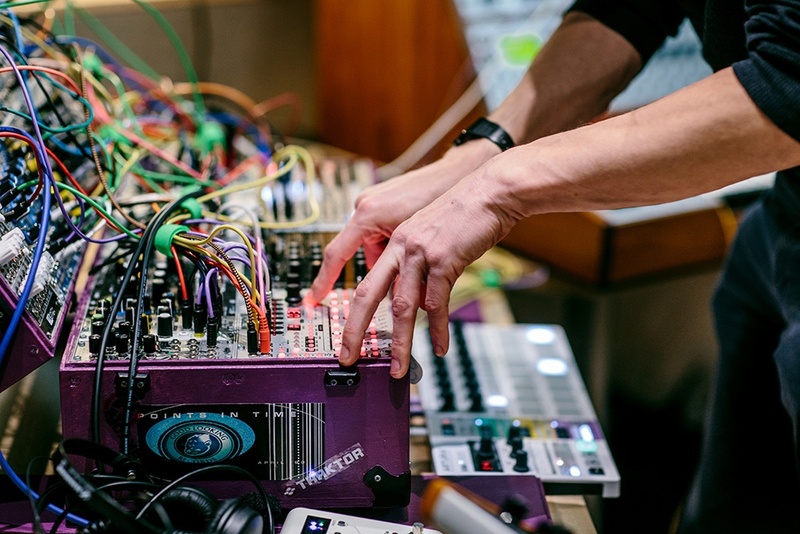 For the next 52 minutes - yes, you read that right - Adrian and the synth orchestra embarked on quite the sonic journey. Eyes close and toes tap in the control room. All ears are entranced by the music as the natural tension and release of the piece plays out. It’s elating, dissonant and atmospheric, with some real moments of beauty where everyone in the room locks into the same groove. At the desk, Jay follows the performance with the notation in front of him, announcing that they’re “on the last cell” to the room. Through the glass partition all eyes are on Adrian as he begins to conduct the students for the finale. One by one, the synths fall silent until one lone player issues the last notes of the almost hour-long rendition. The silence feels like it lasts a lifetime before an eruption of applause from both rooms. The experience of watching it happen live can’t be put into words, but it’s safe to say that this will be day to remember. Huge congratulations to Jay Auborn, the students and staff for pulling off such a difficult performance, and a massive thank you to Adrian Utley for adding a little more magic to the city of Bristol.